This edition of Muscle Car Milestones looks back at the 1971 Dodge Charger 426 Hemi. By 1971, the Hemi had earned its reputation on the street and strip as a fearsome competitor to General Motors’ 455 and Ford’s 427 Cobra Jet. But as the old saying goes, all good things must come to an end. 1971 represents the end of an era as it would be the last year the Hemi would be found under the hood of the Dodge Charger. Let’s travel back in time and see what makes the 1971 Dodge Charger 426 Hemi such a special car. The 1971 Dodge Charger looked quite different from the previous generation. It sported a more curvaceous, Coke-bottle shape, was two inches shorter in wheelbase, and was three inches shorter in overall length than before. It also sported ventless side windows, concealed windshield wipers under the hood, and a split front bumper. Even with emission crackdowns by the government, the Charger still had an impressive V8 engine lineup available. The R/T came standard with a 370 horsepower 440 Magnum. The 440 Six Pack with 385 horsepower was also available. But if you wanted to run with the big dogs, you opted for the 426 Hemi. The 426 Hemi was rated at 425 horsepower and 490 foot-pounds of torque with a compression ratio of 10.25:1. While most car makers were detuning their big block engines and lowering compression ratios, Dodge stood out from the crowd by keeping the 426 Hemi alive with the same horsepower and torque numbers it had in 1970. Motor Trend put the 1971 Dodge Charger 426 Hemi to the test in their December 1970 issue. They achieved a 0 to 60 time of 5.7 seconds and dashed the quarter mile in 13.73 seconds running 104 miles per hour. Compared to the 1971 Chevrolet Chevelle SS 454, the Hemi Charger was 0.3 seconds quicker from 0 to 60 and 0.27 seconds quicker in the quarter mile. The 1971 Dodge Charger 426 Hemi could be ordered with the Super Bee package. The Super Bee package got you features such as heavy-duty suspension and brakes, Rallye Instrument Cluster, and performance hood with blackout treatment. And with the Hemi, the Ramcharger vacuum-powered air scoop was standard. This feature fed fresh air into the carburetor by pulling a knob located on the dashboard. It also had a really cool graphic that was visible once the scoop was activated. 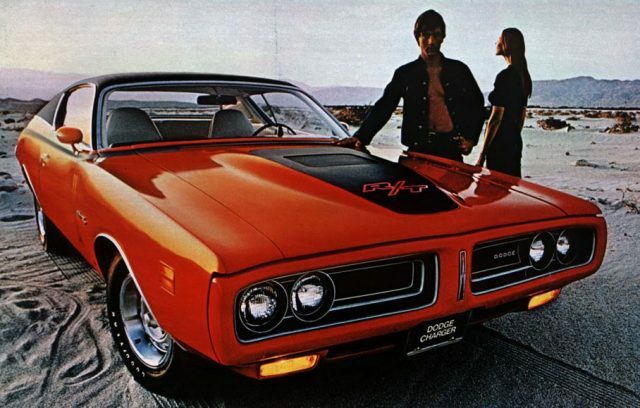 The Super Bee was created to be a worthy adversary to the Plymouth Road Runner and the Pontiac GTO. Only 85 Hemi Chargers were created in 1971. 63 Hemis went into the R/T and a mere 22 Hemis were planted under the Super Bee’s hood. This superiority was not cheap. With a price ranging between $707 for the R/T and $837 for the Super Bee, the Hemi was roughly one-fourth the price of the car. There’s also very little mention of the 426 Hemi in any Dodge advertisement or brochure from 1971. It’s almost as if Dodge wanted to keep the Hemi a secret. Truth is, with Uncle Sam and the insurance companies putting the squeeze on the muscle car, it’s no wonder the Hemi disappeared after 1971. The last Hemi Charger rolled off the assembly line on July 30, 1971. It was painted Top Banana yellow with a black interior and sold new by Mabe-Cartwright Motors in Welch, West Virginia. In recent years, it made its home at the Wellborn Musclecar Museum in Alexander City, Alabama. In January 2015, it was sold at the Mecum Kissimmee auction for $295,000. And just like that, it was over. When the Hemi Charger appeared in 1966, it entered the market where the Pontiac GTO and Ford Fairlane had already established their reputations as formidable competitors on the muscle car scene. But the end of the decade, the Hemi Charger had earned its legendary status and was now a fierce contender on the street and drag strip. The 1971 Hemi Charger was the last holdout to this legacy. The coming years were not kind to the muscle car but at least the Hemi went out with a bang instead of a whimper.